In the third of the Fantasyland series, the trio dedicated this concert to the memory of Jack Brymer, the eminent clarinet player who died recently. 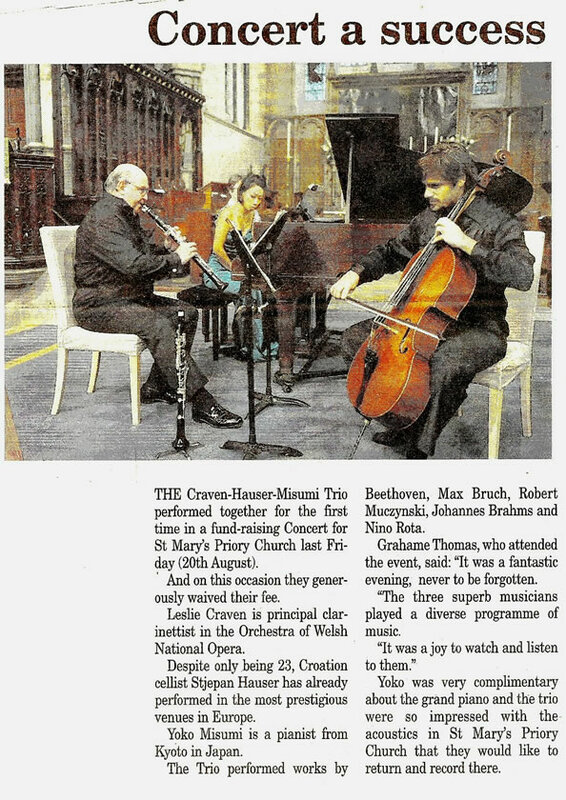 Leslie Craven (clarinet) and Dewi Watkins (cello) are regular members of the Welsh National Opera orchestra and Anthony Negus (piano) is one of the chief conductors with the opera company. In the Brahms Clarinet Trio in A Minor, there is a quiet opening theme from the cello but soon all three players were committed to a perceptive and stylish performance of this appealing work. Mr.Craven’s playing of the adagio showed considerable warmth and beauty, and each instrumentalist had an important part to play in the finale. Iin complete contrast, a modern work by the contemporary American composer Robert Muczynski showed the lower registers of the three instruments in the earlier movements and there were tuneful moments among the discordant sounds. Roma Cafolla, the Irish-based composer, wrote the final piece, Arcanum, especially for the trio and she only completed the score a fortnight ago, so this was a world première. A melodic opening on the piano soon leads into a magical theme for the clarinet and cello. After a fast passage, the mood then returns to a passionate mode before ending in a delicate pianissimo. This is certainly a piece worth hearing again. Reviews in this space mostly concentrate on international artists, big-name orchestras and venerable composers. For a change, here’s a collection of music that should be within comfortable reach of talented players at home, music that would be invaluable to anyone studying the clarinet. A charmingly lyrical selection of single pieces, sonatas and fantasias from Derry-born composer Roma Cafolla, it won’t set the world on fire but will make a solid addition to the chamber repertoire. …almost everything seems to have been written for Craven himself. I was particularly taken by the two witty pieces by French naval clarinettist Daniel Bimbi , and Christopher Ball’s delightfully simple folk songs with harp. But everything on the disc is enjoyable …Craven plays …with a svelte woody sound and fluent technique …we should be grateful to him for introducing us to so much new material and the CD is well worth acquiring by all aspiring recitalists. 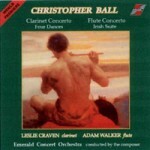 Expressions is a CD of a variety of music for clarinet in several settings… the title Expressions is well conceived however because every piece is relaxing and has something to say …every number is worth listening to… Leslie Craven has a solid sound and although not a young man, one does not hear this in his playing. He sounds like a young virtuoso, a vigorous musician and plays the pieces enthusiastically, and expressively. His sound is warm and focused and his tone has feeling. …he plays on his own design mouthpiece, the ‘Leslie Craven model Mouthpiece’. In Leslie Craven, the dedicatee, he has the ideal interpreter, commanding and brilliant but above all, warmly expressive, a beautifully full and singing sound throughout the compass, with a distinctive ‘English School’ vibrato. 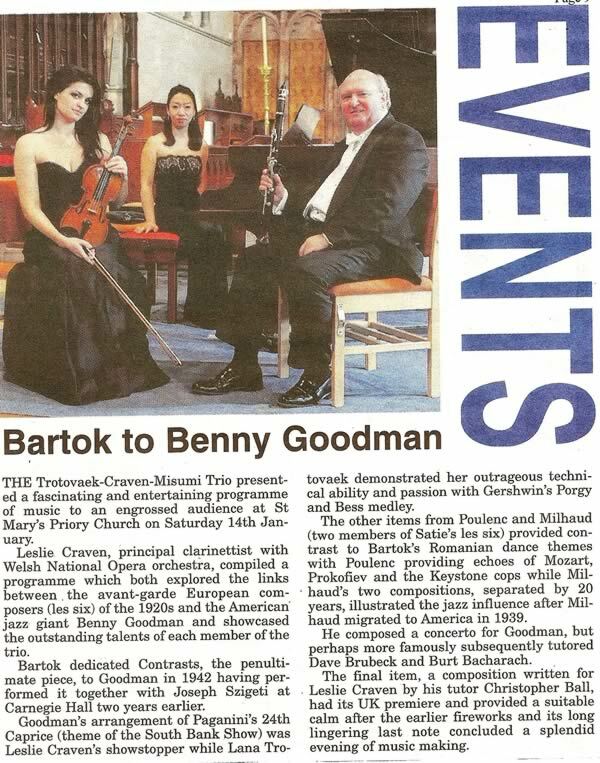 “Melodious beautiful …very agreeable to listen to… long lyrical melodies and considerable virtuosity… the dedicatee clarinettist Leslie Craven… plays with a beautiful smooth, supple tone… with a splendid control of dynamics and finished with a hint of vibrato. Yesterday was the centenary of the birth of Nino Rota, the Italian composer mostly known for his scores for Fellini, Visconti, Zeffirelli and Coppola, though he also wrote 10 operas, five ballets and several chamber works. 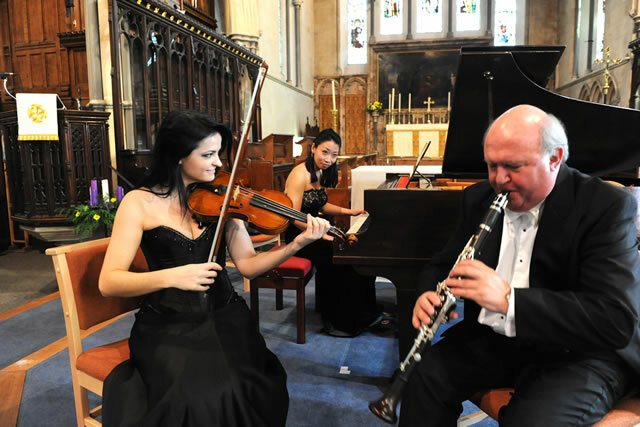 Leslie Craven, principal clarinet of the Welsh National Opera, here brings his lovely warm, round tone to bear in Rota’s seductive Clarinet Sonata and brisk, lively Trio, both far less profound than Brahms’s familiar Op 120 Sonatas Nos. 1 and 2 but delightfully playful and effortlessly tuneful nonetheless. Ewenny Priory 21st August 2004 7.30p.m. Soloist: Leslie Craven with The Vale of Glamorgan Ensemble. 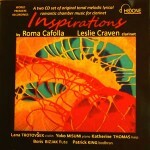 Mozart – Stadler ; Weber – Bärmann ; Brahms – Mühlfeld … Clarinettists owe some of the finest works to such partnerships of composer and performer, and it was the lyrical playing of W.N.O Principal Clarinettist Leslie Craven that rekindled the creative spark of Roma Cafolla.